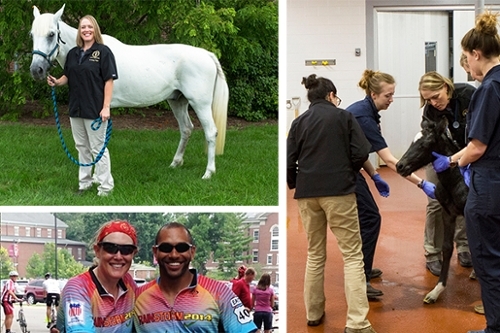 Purdue Veterinary Medicine is excited to celebrate the talented members of the PVM faculty with a weekly spotlight on those who have been approved for promotion this year. This week's feature begins with Dr. Sandy Taylor, assistant professor of large animal internal medicine, who has been promoted to associate professor effective July 1. In 2001, Dr. Taylor earned her DVM degree at Washington State University (WSU), then completed an internship at an equine hospital in Tacoma, Wash. After completing an equine internal medicine residency at the University of California, Davis, she received her board certification in 2006 and returned to WSU where she earned a PhD in immunology in 2010. In December 2010, Dr. Taylor started her career at Purdue! As a faculty member in the Department of Veterinary Clinical Sciences, she's split her time between clinical duties, teaching, and research. According to Dr. Taylor, her passion for veterinary medicine began at a young age. "I have had a passion for horses since I was young, and became interested in veterinary medicine during my undergraduate studies. I have always enjoyed the challenge of solving complex clinical problems, and wanted to find a career where I could also teach." The PVM family loves having Dr. Taylor's lively personality shining through Lynn Hall, and she showcases her passion for her field in everything she does. Veterinary medicine is not the only thing Dr. Taylor is passionate about, she also enjoys riding her bicycle (including participation in a cross country relay) and spending time with her family, which includes her two Labradors. When asked if she had any advice for people looking to pursue a career in veterinary medicine, she commented, "Explore many aspects of veterinary medicine; you never know what area might grab your attention! Study hard, work hard, and have the time of your life." Well said, Dr. Taylor!